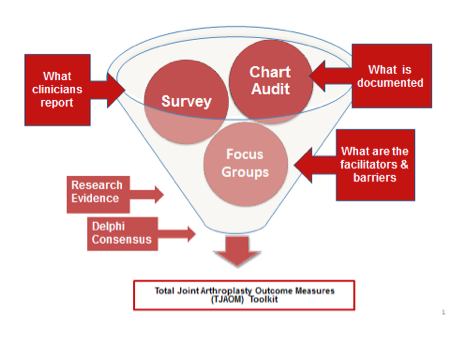 Five years of work has culminated in the launch of a toolkit providing resources to help health care providers select, apply, score and interpret outcome measures for patients with total joint arthroplasty (Total Hip Arthroplasty and Total Knee Arthroplasty) along the continuum of care. On-line learning modules for each outcome measure are currently being finalized. These e-modules include: a video providing a review of how to find, assess, apply, score and interpret outcome measures; interactive text with clinically relevant information; a video of how to undertake each performance-based outcome measure; and a pre/post questionnaire to reinforce key messages. McAuley C, Westby MD, Hoens A, Troughton D, Field R, Duggan M, Reid WD. (2014). A survey of Physiotherapists’ experience using outcome measures in total hip and knee. Physiotherapy Canada..2014. 66(3)’ 223-4.274-285. Westby MD, Brittain A, Backman CL. Expert consensus on best practices for post-acute rehabilitation after total hip and knee arthroplasty: A Canada-US Delphi study. Arthritis Care and Research. 2014:66(3):411-23. The literature Key best evidence regarding outcome measurement and outcome measurement specific to the TJA population. A chart audit (convenience sample) across the phases of care (prehab, acute and subacute) and practice settings ( inpatient, outpatient and private practice) providing data on what BC physiotherapists document with respect to the use of outcome measures in this patient population. A focus group providing qualitative data on the barriers and facilitators to use of outcome measures in this patient population. A cross-sectional survey (randomized sample of targeted groups of BC Physiotherapists) providing quantitative and qualitative data on which outcome measures are reported as used, or will be considered for use, in this patient population. A Delphi survey (expert panelists including patients, health care providers & researchers from multiple disciplines in Canada & the US) providing consensus on best practice recommendations for rehab management and outcome evaluation of TJA patients.